Activated carbon or activated charcoal is a material that is widely used in various industries, as auxiliary processing. Food, beverage, energy, mining and pharmaceutical industries use this activated carbon. The need for activated carbon also continues to increase so that production also needs to be expanded. Indonesia has great potential as a world class activated carbon producer considering the abundance of potential raw materials available. Currently, large activated carbon producers are located outside Indonesia such as Europe and America. Yet neither Europe nor America have abundant source of raw materials or most imports including from Indonesia. The most favorite activated carbon feedstock today is coconut shell and once again Indonesia is the country with the largest coconut plantation in the world, which is about 3.7 million hectares. Palm kernel shells can also be the raw material of further choices. With a palm oil plantation area of approximately 12 million hectares, palm kernel shells produced more than 10 million tons / year. The raw material of activated carbon is charcoal. The charcoal is then activated to become activated carbon. The process of making charcoal is by carbonization or pyrolysis. Coconut shell as an example of raw material of charcoal, then after carbonization the coconut shell convert into coconut shell charcoal, which then this charcoal become the raw material of activated charcoal. So basically the process of activated charcoal production is through 2 stages of the process namely pyrolysis (carbonization) and activation. The process of producing the charcoal or the carbonization process (pyrolysis) is the same as the biomass carbonization process in general, for more detail can be read here. Currently in large capacity the production of charcoal is carried out continuously with indirect-heating. Rotating kilns and heated auger pyrolyser are commonly used equipment for continuous production of charcoal. Continuous integration of charcoal production and activation process can be read here. While the activation phase can be done in two ways namely the activation of physics and chemistry. The choice of activation depends on the target surface area, pore distribution and economy. Steam activation is the most widely used physics activation, whereas chemical activation is very diverse. The more surface area of activated carbon the more expensive the price is also proportional to the cost of production. Activation equipment commonly used there are 2 kinds namely, rotating kilns and fluidized bed. Of these 2 types of rotating kiln equipment is more widely used than the fluidized bed. The price of rotating kiln equipment is cheaper because the construction and operation are easier than the fluidized bed system. Fluidized bed systems are typically used for higher quality activated carbon production due to better distribution and pore engineering due to fluidization. Standard and quality of activated carbon is determined primarily by surface area, pore distribution, size and hardness. The iodine number parameter is commonly used for the quality of activated carbon. The higher the iodine number the better the activated carbon quality. The iodine number is a number indicating how much adsorbent or activated carbon can adsorb iod. The greater the iodine value, the greater the adsorption power of the adsorbent or the activated charcoal. 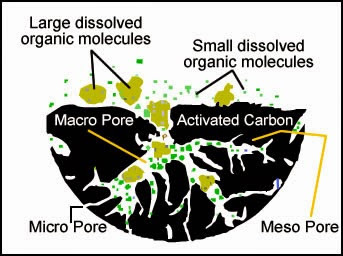 Conversely, the higher water content and ash content contained in the activated carbon will cause many pores to be covered by the impurities so that the surface area will be smaller. Where the surface area is closely related to the activated carbon adsorption capacity.All biomass basically can be used as an activated carbon raw material because it has a carbon content. Specific application of the activated charbon that determines the choice of raw material and its activation options.